I’ve been a keen backer of projects on Kickstarter for over a year now, and have backed over 100 projects, with most of them reaching their goal (sometimes only just). The attraction of new gadgets/books/games/AR/posters that hit a specific niche seems to be easily filled by someone’s eye for opportunity or desire to bring something they love to life. However, with over 100 projects back, it is not surprising that many projects miss their originally target dates for completion. Anyone who has ever worked on any kind of project knows this – it happens, people are bad at estimating how long large projects take. That isn’t to say poor estimates are to blame, some of the projects backed changed designs (part no longer in production/more money better parts/fit a new requirement), some were hit by sudden death of key members of their team, huge impact of demand for the project, manufacturing issues, customs being terrible, shipping companies sending things to the wrong destination – the list goes on. 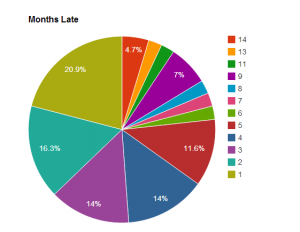 Someone at work posted some interesting stats about how many projects had arrived to schedule and I thought it be interesting to take a look at similar stats for my backed projects. Above is one of the charts I came up with. I thought starting with projects that have not been delivered and are currently overdue. I’ve taken the date for the pledge level to be the date of completion not the beginning (things might look a bit better on months 1-4 in these cases). Just over half of the late projects are over 4 months late with 3 being over a year late! This has me a little worried given the number of projects I have backed and I am starting to understand why some publishers/organisations wouldn’t have given the project the light of day. That said – of the late projects, the vast majority I am happy enough with why they are late – apart from 1. PhoneSoap – they changed their design to fit the iPhone 5, by the time the change was made a part wasn’t being made anymore, the new part they choose to replace it wasn’t manufactured in anywhere near the volume they needed, so it got downgraded to a much lesser component, then there were manufacturing issues, electrical certification issues and finally even the US Government Shutdown/Democracy failure. Still – many have delivered, and some beyond my original expectations. Part 2 will continue with more stats and charts.